The doctrine of the sovereignty of God is so defined in Scripture. The sovereignty of the God of Scripture is absolute, irresistible, infinite. “Our God is in the heavens; he does all that he pleases.” (Psalm 115:3). Ours is a Mighty God who revealed through Isaiah that we should “Remember the former things of old; for I am God, and there is no other; I am God, and there is none like me, declaring the end from the beginning and from ancient times things not yet done, saying, ‘My counsel shall stand, and I will accomplish all my purpose…” (Isaiah 46:9-10). This is a God that gives us hope. This is a God that is in control and works all things for our good for those who are called according to his purpose. (Romans 8:28). This is God that is revealed to us in His Word. Just these verses tell us that everything that exists in the universe exists because God allowed it, decreed it, and called it into existence. Admittedly, those truths are hard for the human mind to embrace, but Scripture is very clear. God controls all things, right down to choosing who will be saved. There is no authority except from God, and those that exist have been instituted by God. (Romans 13:1). He has mercy on whomever he wills, and he hardens whomever he wills. (Romans 9:18). 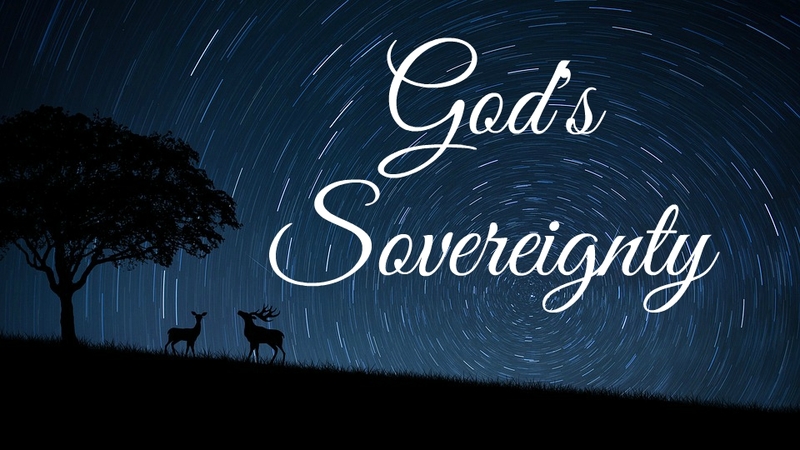 To say that God is sovereign is to say that He is supreme over all things, that there is no other authority but Him. It is to say that His Lordship over creation means that there is nothing out of His control, nothing that God hasn’t foreseen and planned. It means that His plans for our salvation are guaranteed through the absolute power and might of His will. It means all of creation will be subjugated to His will and “that at the name of Jesus every knee should bow, in heaven and on earth and under the earth, and every tongue confess that Jesus Christ is Lord, to the glory of God the Father.” (Philippians 2: 10). The sovereignty of God and the will of God are bound up together. As we ponder this we must take heart because all the promises of God including His purposes for our lives are bound up through His determination and He works His determination for our good. We know this because He has told us that “My counsel shall stand, and I will accomplish all my purposes.” (Isaiah 46:10). We know this because He has assured us “that for those who love God all things work together for good, for those who are called according to his purpose.” (Romans 8:28). ← Let us then with confidence draw near to the throne of grace.